Joy De Vivre Design: Celebrate with me! Last year I had such a wonderful year being a Glambassador for Glamour. Having the opportunity to do fashion events, try makeup and do reviews for other products as well, was right up my alley! On top of that I met many wonderful girls from different parts of the country who all shared common interests. This year has already started off in a fantastic way with a Dior Beauty mission. 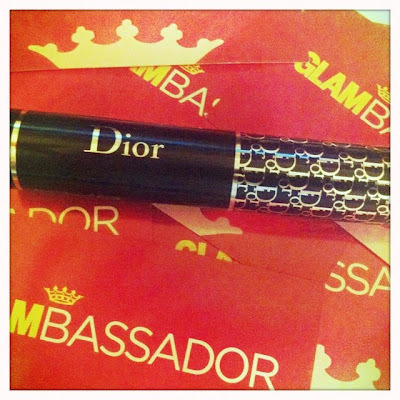 First up we received Dior Diorshow Mascara to review! I was excited to try this one after reading it was one of Natalie Portman's favorites. Being someone whose makeup always looks flawless, I figured Ms. Portman has to know her stuff...and indeed she does! I had never tried Diorshow before, but after experiencing it I will be a forever fan now. It really makes you look like you are wearing false lashes! So now I would like to make a forever fan out of one of you! Between now and next Friday, the 11Th, enter to win Diorshow! 1. Leaving a comment here about your favorite makeup product. Also Glamour has a complimentary shipping code with Dior right now! When shopping on dior.com enter code GLAM1 at checkout for free shipping! ooh I need this; my lashes are so skimpy. I wouldn't normally pay this much for a mascara, but if it works like you say, I'm sure I would! Right now my fave makeup is Larenim brand eye shadows, they're great. I don't wear any so - don't count me in on this one! :) I just wanted to say hello and see what you were up to. iam out of mascara and I would love to try this one, my lashes need all the help they can get. I would love to try this my lashes need all the help they can get. I would love to try this as well! OOps I forgot to write what my favorite right now is Cover Girl, in the yellow container. Not sure of the name. I love my Constance Carroll Toucvh Away concealer in the sade 3(dark)... it covers up the huge bags under my eyes like nothing else.